Strawberries are popping up at grocery stores at great prices right now, so pick up a few quarts and make some fabulous strawberry shortcake. 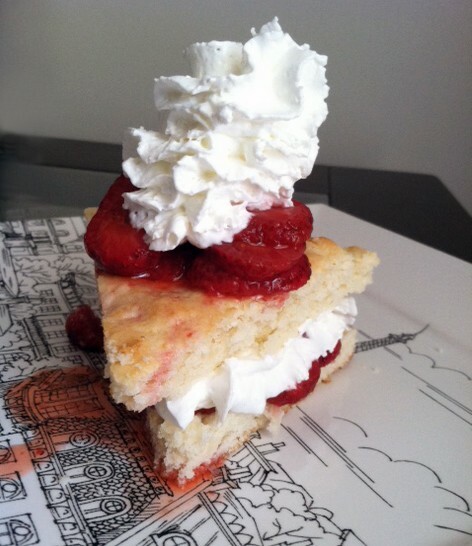 Here's an oldie but goody strawberry shortcake recipe from Betty Crocker. It's totally a cheater's recipe using Bisquick mix, but it's easy and good, so who cares. Just don't tell anyone. You can make individual shortcakes or make one giant biscuit and then just cut it into wedges like I did (this way is easier). I was a super cheater and even used whipped cream from the can instead of whipping my own from scratch. Shhh.... It's our secret. Bake 10 to 12 minutes or until golden brown. Meanwhile, in small bowl, beat whipping cream with electric mixer on high speed until soft peaks form.